Discussion in 'Iowa Long Beard Conference' started by Cooter, Apr 8, 2019. I was settled in the blind at 5:05AM. Pumped to hear the thunderous gobbles I heard Saturday when scouting. Only one bird gobbling in my area so I didn’t have high hopes that he would come in. Had both my jakes out and that will usually hang up a lone bird. To my surprise he flew down and came right in spitting and drumming the whole way. Thought the three deer that came up we’re going to bust me and scare him off. Just the opposite they herded him and pushed him right to me. When he got to 15yrds I let the Bullhead eat. Dropped in his tracks couple flops a squeak from his cut windpipe and it was over. Great morning. Bowtech84, goatman, 203ntyp and 2 others like this. Wow!!! Your pictures are outstanding, Congrats! Lol here is the spread. Damn that looks like a real bird (the decoy). 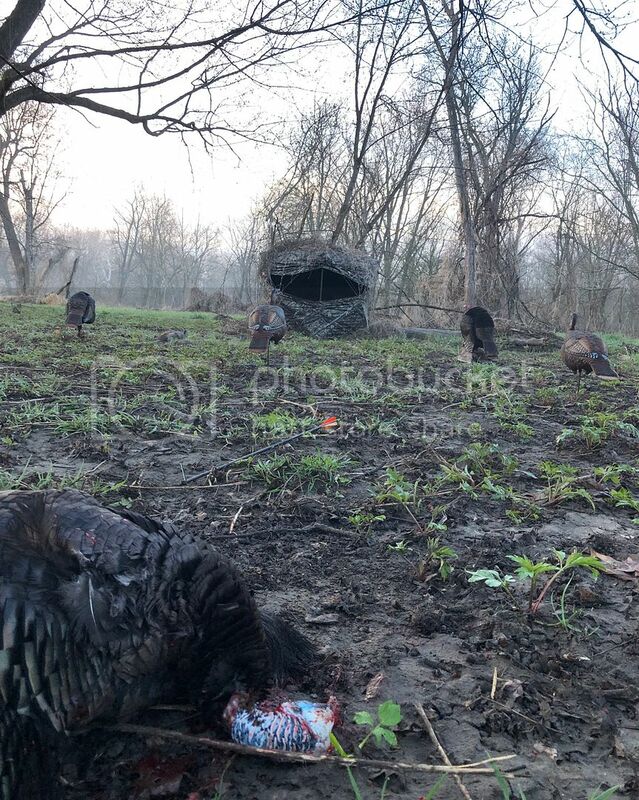 Nice set up and photos as well as the bog old gobbler Cooter! How do you get all the decoys out there? I use a game cart with one of those bungee nets to hold everything on. I just got a new one with pneumatic tires and all bolted together no clips to rattle. I set everything up where I’m gonna hunt that morning the night before. Definitely not a run and gun setup. 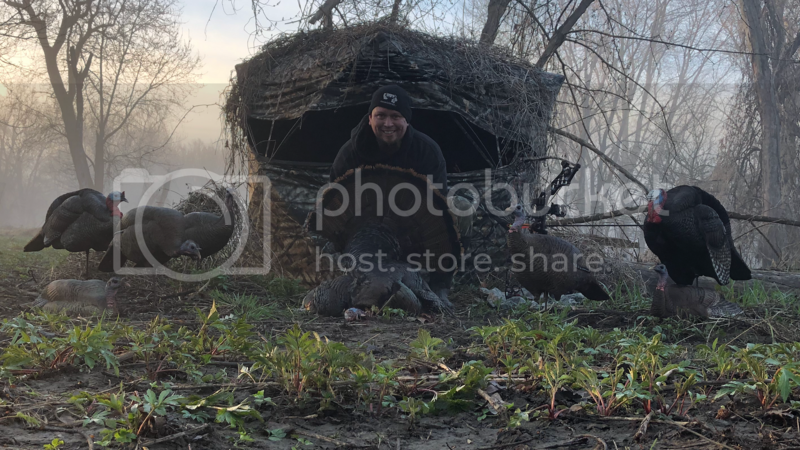 Great pics for sure...congrats on a successful hunt! Great pics and job well done Cooter!